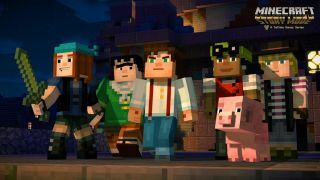 Amazon reckons it has a release date for Minecraft: Story Mode, Telltale's upcoming narrative adventure set in the Minecraft world. Before I go on, I should point out that Amazon often seems to just make these things up so there's absolutely no guarantee that this date is anywhere close to the actual release date. Just in case: Destructoid noticed an October 27 release date on Amazon.com. I checked on Amazon.co.uk, and it's listing October 30 for the console versions—PS4, PS3, Xbox One and 360. There's no PC listing on either site, and Steam has nothing either, but we can safely assume that the PC version will come out on the same day if Amazon hasn't just made it all up.